UPDATE: The author of ManOpen has updated it for Intel and the latest version of OS X as of writing (10.8). Get it here. 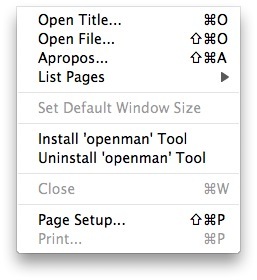 Carl Lindberg's ManOpen has for a long time been my Mac OS X tool of choice for viewing man pages. It's an excellent piece of software with many useful features, but unfortunately it has not been updated for a very long time. As of writing, Mr. Lindberg himself had not made an Intel-native version of the application available, so I have opted to do so myself. This is ManOpen 2.5.1, compiled for Intel only. It should run on any Intel-compatible version of Mac OS X. In addition to getting the code to compile for Intel, I also added a couple of menu items to the file menu in order to facilitate installing the openman command line utility.